Vulture was published by Reaktion Books in 2011. You can visit the publisher’s website here. Vultures circling in the sky above, or simply sitting and watching, are almost universally associated with death. But, while it is undoubtedly true that vultures have taken to a life of scavenging with particular enthusiasm, there is far more to this diverse and fascinating family of birds than a simple association with putrefaction and the macabre. Vulture offers an enlightening new natural and cultural history of this much-misunderstood bird. There are big vultures and little vultures; vultures that are despised and others that are deeply loved; and there are vultures that eat predominantly bone, and others that have gone (mostly) vegetarian. In human communities vultures have occupied predictable roles like disposing of the dead and officiating over human sacrifices, but they have just as often been viewed as courageous and noble creatures, as indispensible in the containment of waste and disease, as world creators and divine mothers. 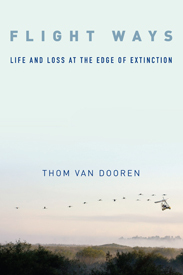 Thom van Dooren explores these many histories, from some of the earliest-known Neolithic sites in which vultures are thought to have consumed the dead to the renaming of the California Condor and contemporary efforts to reintroduce the bearded vulture into the Alps. Highlighting the rich diversity of vultures and the many ways in which people have understood and lived with them, Vulture invites a new appreciation and wonder for these incredible birds.